Are your bond assets safe in a rising rate environment? 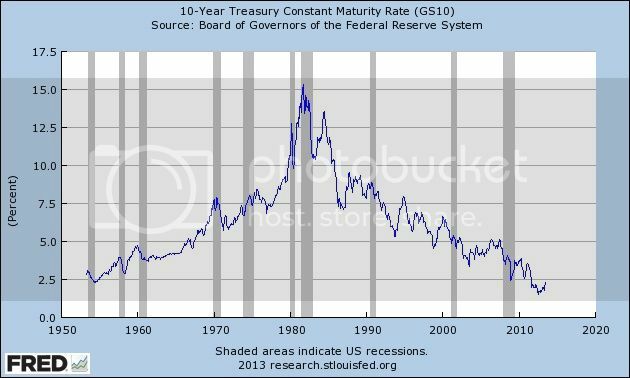 The bond bull market has been running hard for over 30 years but it appears to be over as long-term rates hit historic lows in 2012. Many investors have never lived through a rising interest-rate cycle and aren’t prepared for a secular bear market in bonds. As you can see in the chart below, the last bond bear market lasted just as long as the current bull. Rising rates can inflict significant damage to bond assets which are supposed to be the safe side of an investment portfolio. When interest rates rise, the market value of bonds falls and the losses can be substantial. So how do you protect your bond investments? For our clients, we recommend owning a laddered portfolio of individual bonds. Rising interest rates do not impact returns on bonds that are held to maturity, at which time the face value of the bond is paid back. We also recommend staying short duration. As bonds mature, client assets can be re-invested at higher yields. Many investors buy bond mutual funds or exchange traded funds. Some believe that these are safe assets that don’t decline. However when interest rates rise, fund values fall to reflect the current value of bond holdings. Investors may never recover these losses because there is no maturity date when the holder is paid the bond’s face value. Therefore, assets that investors believed to be safe carry significant risk in a rising rate environment. Bond ETF prices over the last year clearly illustrate the impact of rising interest rates. The 10-year Treasury bond yield rose from 1.46% on July 20, 2012 to 2.74% on July 5, 2013. Over the same time period, here is what happened to two popular ETFs which hold Treasury bonds. As one can see, holding the wrong bond ETF can be extremely damaging to assets even over a short period of time. Recently, target maturity bond ETFs have been launched to help manage interest rate risk. Target maturity bond ETFs are designed to perform like individual bonds. They pay regular distributions and have fixed maturity dates. The bond holdings are structured to mature by the ETF maturity date. As this date approaches, the fund invests proceeds from maturing bonds in cash. At maturity, the net asset value is distributed to investor. Currently, Guggenheim and iShares offer several municipal, corporate and high yield ETFs in this category. In conclusion, with rates on the rise and the Fed talking about tapering, it is imperative that investors know exactly what they own and how rising rates will impact their portfolio. Are your bond assets in the safe zone? If not, the time for action is now. Runnymede Receives Top US Captive Services Award For "Innovation in Investment Management"